Having someone speak at your event can always be an interesting way to break up a day. Maybe you are looking to fill a gap in between a sales presentation and lunch or maybe you really do need someone who knows about quantum physics. The speaker could be there to provide background information on the trends in your sector to explain a complicated subject to your audience. It's likely that you already know who you want. Maybe a famous psychologist or a celebrity chef, you'll probably need to contact their agent in order to hire them for an event. If you are struggling to find their agent then scour their website, send some emails and make some calls to the contact info listed. You should know how long you want them to talk for, what you want them to talk about and the sort of audience they'll be speaking to. All these could factor into the price you will be paying to have them at your event. If you contact a board such as the Royal Horticultural Society for a speaker on gardening then they will be more than happy to point you in the direction of a speaker. If you really have no idea where to start then you should take a look at speaker booking sites. There are hundreds of sites out there with a huge list of speakers and the subjects they can talk about. 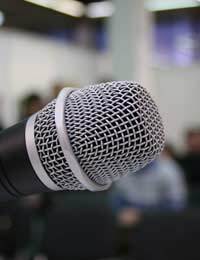 Do you have good relationships with other companies, do they maybe have speakers that would add something to your event? If so then give them a call talk about what they can do for you. They might want their name on some of your marketing material or simply some money. Or if you have a really good relationship with them then you'll just have to owe them a favour. Maybe one of your experts can speak at their next event. There are sites, such as Speaker Match, which will allow you to search for all sort of speakers. These could be motivational speakers, experts or teachers. You may also get to hear some previous work, speeches they've given and will be able to take a look at their CV to see if the people you find are suitable for your event. It might also be worth visiting other events and seminars where there will be speakers. You might want to book the same speakers or you might get some inspiration for the types of speakers you want at your event.